Before the December 2016 presidential election, many people in this country were resigned to the fact that Dictator Yaya Jammeh could not be removed from power through the ballot box. That belief was a clear reflection of how much he dominated the political scene. How much, through the various forms of manipulation of the electoral process under his watch including the use of threats intimidation and quite frankly the very successful use of the divide and rule tactics. Despite these handicaps, political parties never gave up hope, of one day winning an election against him. Because the political playing field was never equal under Jammeh, the United Democratic Party was the only party brave enough to organize peaceful protests to demand for electoral reforms in the run up to the 2016 elections. Those protests led to the detention, and eventually the death in police custody of Solo Sandeng, a UDP youth leader. The UDP Leader himself, Ousainou Darboe was also arrested, and imprisoned, on trumped up charges, of together with most members of his Executive Committee simply for marching to demand the release, dead or alive, of Solo Sandeng. In other similar instances, dozens of UDP female and youth militants were arrested, raped and tortured by Jammeh`s thugs for peacefully protesting to demand that justice be done. It is interesting to note that of all the other political parties on the ground, the only one prepared to take the risk of openly defying Jammeh`s thuggery by expressing the dissatisfaction of its militants was the UDP. All the other parties preferred to comfortably crouch back in their comfort zones and watched the UDP do the dirty work for them. In the process, they joined the dictatorial regime of Jammeh to brand the UDP as the trouble makers and categorized its militants as hooligans. Then when the dust had settled with the entire leadership of the UDO illegally incarcerated, they stepped forward to reap the benefits. The parties that were guilty of this shameful behavior, blamed the UDP for not consulting with them or, for failing to invite them to take part in the protests. But given the despicable level of atrocity and violation of every human rights one could think of at the time, did anyone, genuinely fighting for change, needed to be consulted or invited to speak out for justice and fair play? The attitude of those parties and their response to the then pathetic state of politics in the country was nothing short of hypocrisy tainted by their collective disdain for, arguably the biggest opposition party, the UDP. It was under these circumstances that we went to the polls in December 2016 for the presidential elections. 1. A congress of all interested political parties with each sending 70 delegates shall select a flagbearer from among the nominated candidate of each of them. 2. The candidate who is selected shall resign from his/her party to assume the new role of “Coalition Flag-bearer”. 3. If the selected Coalition Flagbearer wins the election, he/she will be President for three years heading a transition government which shall carry out reforms, essentially the ones the UDP was fighting for, such as electoral, constitutional and institutional reforms including reform of the Civil Service. 4. At the end of the three years, the transition administration will stepdown, making way for all political parties to go back to their individual programs, elections will be organized and a new full-term president is to be elected. These were the broad terms agreed and accepted by all the parties. In the ensuing congress, the relatively unknown Adama Barrow, the UDP nominee, was selected and he became the Coalition Flag-bearer. In conformity with the agreement, he resigned from the UDP, to assume the position in preparation for the December 2016 presidential election. The drama that followed the announcement of his victory in that election will be the subject of a future discussion. For now though, the question we should be asking is, has the country really got what everyone fought so hard for in December 2016 to remove Yaya Jammeh? Have Adama Barrow and the Coalition government remained true to the terms of the MOU the parties agreed? And are they delivering what the people expect from the change? In short, is the New Gambia a reality or just an illusion? The simple answer to these questions is “No all these questions”. To begin with, cracks in the Coalition began to appear shortly after the government was formed as some of the prominent actors declined to take up any responsibility in the new government but took pleasure in criticizing the very institution they had helped to create. A reflection of the same pathetic attitude those people demonstrated before the election, when they refused to join in the protests against injustice, preferring to sit on the fence and hypocritically claim the moral high ground. The real reason for opting to stay out of the coalition administration is the failure of their plans to hijack power to promote their political ambition. They wanted only so-called intellectuals to be appointed, wanted to be second in command and wanted to remain the dominant voice of the coalition. When they realized that all these things were slipping through their fingers, they decided to turn their backs to the Gambia and her people. The implosion of the coalition was therefore only a matter of time. The divisions continued to exacerbate as the various members began pursuing their different agendas. 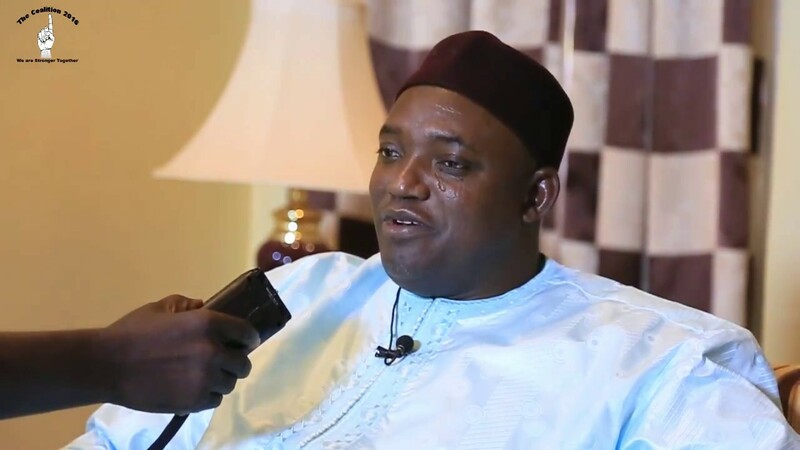 The Flagbearer, now President Barrow, lost grip of the situation and found it difficult, because of pride or ambition for power to connect to his base for advice and direction. He slowly began to be influenced by selfish individuals and little by little he began the coalition and showing signs that the MOU was meaningless to him. He has not yet said it openly but all indications are that that he would like to stay in power for five years or more. Understandably the other coalition partners began to feel betrayed. The fallout became so bad that today, three of the original parties are no-longer in the Coalition government whose direction is becoming more and more uncertain. For all intents and purposes, Barrow has become the de-facto voice of the coalition and is increasingly steering a course different from that which he originally agreed prior to the December 2016 election. Given all the political machination that we are witnessing it is fair to say that the country is slowly drifting back to a situation similar to the Jammeh era of a one man rule who controls everything in Gambia. It appears that the Coalition, and by extension President Barrow, has lost sight of the objectives that inspired the struggle against dictatorship and its massive abuse of power and the use of bigotry for self-perpetuation. Certainly that is not what Gambians bargained for and everything possible must be done to ensure that the real benefits of democracy, which Gambians voted for, are given to them. The starting point for such a process is the respect for promises made. If only the coalition agreement is respected and observed, despite the sweets of office, President Barrow and his coalition partners will go down in history as truly honorable men and women who came and kept to their word. But alas, it appears that Barrow has put himself in a political quagmire. He cannot choose between staying loyal to the coalition and staying loyal to the UDP a party he resigned from in October 2016. This is a classic case of “You cannot have your cake and eat it”. Or, is it another case of Power corrupting yet another African leader who has become incapable of imagining life outside and beyond the pomp and glamour of the presidency. Without a shadow of doubt, “What we are getting today, is certainly not what we bargained for”.